The extensive flooding and storm damage from Hurricane Sandy burdens property owners with the tasks of significant clean-up and restoration. The recovery effort cannot end on the surface level due to the extensive threat of mold lying beneath structural framework and unconditioned areas. Hard surfaces are not immune to housing the perfect spot for mold to grow, spread, and create another obstacle for commercial and residential occupants. MMR Mold Stain Remover is the preferred, commercial-grade mold and mildew stain remover compared to bleach, hydrogen peroxide and repeated scrubbing. The unique formulation of EPA registered ingredients of MMR Mold Stain Remover is the proven fast and easy solution to remove mold from wood and porous building materials including concrete, masonry and composite decking. Target mold and mildew stains hiding in any size home attic, basement or crawl space. 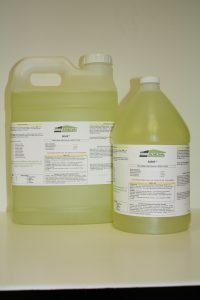 The ready-to-use MMR Mold Stain Remover is a spray-on application covering up to 250 square feet per gallon when used according to MMR specifications. Pair ShockWave disinfectant with MMR Mold Stain Remover for the complete mold and mildew removal solution. Shockwave disinfectant and MMR Mold Stain Remover work together to clean mold stains and ensure leftover mold bacteria does not re-grow and infect hard surface areas again. The biodegradable and non-flammable formula maintains a safe living and working environment throughout mold remediation and overall restoration of a home, business or office location. Restoration contractors seeking large quantities of MMR Mold Stain Remover are eligible for volume discounts to assist with the clean-up efforts due to damage from Hurricane Sandy or any mold stain clean-up job. Immediately eliminate mold and mildew commonly seen in building materials after excessive moisture exposure and water damage. MMR Mold Stain Remover is proudly made in the USA and quickly becoming the preferred choice of mold and mildew stain removal for home owners, disaster restoration services, and commercial building maintenance contractors across the country. Remove mold stains, prevent future mold growth and avoid the time-consuming tasks of scrubbing stains over and over only to watch the problem return. Stop the spread of mold stains and put MMR Mold Stain Remover to work on every property damage restoration project.